Due to the UK's insistence for us not to enjoy a summer this year, it was another Sunday holed up in the kitchen, avoiding the rain. Having acrued a bottle of Louis Jadot, Fleurie, Poncereau, 2010. I made it my mission to cook up a storm and find a Fleurie food match. And I must say, I did a pretty good job! Brouilly, Chiroubles, Chénas, Côte de Brouilly, Fleurie, Juliénas, Morgon, Moulin à Vent, Régnié and Saint Amour. Like a lot of confusing things about wine, the word 'Beaujolais', nor the grape variety, does not usually show on the label, so it's handy to know the Crus! They do so in an attempt to separate themselves from mass-produced (and we think a little passé!) Beaujolais Nouveau which is in a league of its own. Beaujolais is generally made of the Gamay grape - thin skinned and low in tannins - and tends to be light-bodied, with relatively high acidity. Brouilly, Chiroubles and Régnié are the lightest of the ten, and typically meant to be drunk within three years of the vintage - good for summer sipping and perfectly delectable served slightly chilled with or without food. Côte de Brouilly, Fleurie and Saint Amour are more medium bodied and tend to have a little more structure and character which makes them perfect with food - light enough for summery grilled meats and salads, but big enough to withstand a wintery stew. Generally they need at least a year aging in the bottle and designed to be drunk within four years of the vintage. Chénas, Juliénas, Morgon and Moulin à Vent are the fullest bodied of the Crus Beaujolais and need the most time aging in the bottle. Usually meant to be consumed between four to ten years after harvest, they benefit from a little patience - which I don't have! With such a range of style and character, it would be terribly difficult to find a Cru Beaujolais that a) you didn't like, and b) you couldn't match with a seemingly endless list of foods. The Louis Jadot Poncereau, 2010 (£14.99 from Tesco Wine by the Case) is fruity and floral with a mellow palate and good structure. With full, ripe red fruits I wanted to find something to bring out its sweeter side so I chose a sweet, meaty leg of ham. Fleurie has the fruit to balance the ham's saltiness and the tannins to cut its richness but because it's lighter in body, it doesn't overwhelm the relatively mild flavour. 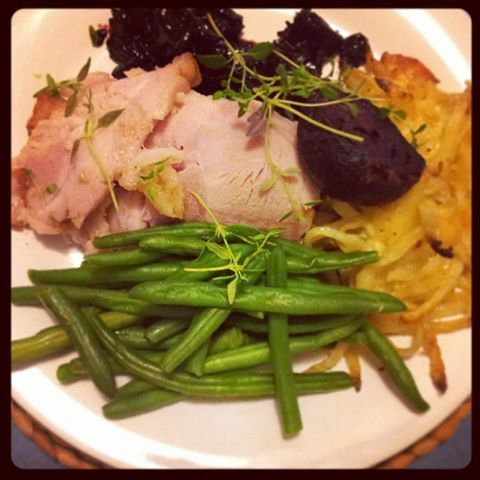 I glazed my ham with honey and mustard and whipped up a beetroot and blackberry chutney to accompany. The mix of sweet, hot and sharp tastes of the spicy mustard, sweet blackberry and acidity in the chutney, suited the Fleurie with its wild-cherry aromas, juicy red fruit and fresh acidity.